President Brigham Young saw the need for charity, “the pure love of Christ,” to smooth the path of life. His actions toward Lucy Groves are an example of his kindness and service to others: On the westward trek, Lucy fell under the wheel of the family wagon, breaking her leg and several ribs. President Young set the broken leg and gave her a blessing. A few days later Lucy’s daughter stumbled over the leg and broke it a second time. In agony at every step the oxen took, Lucy asked her husband to pull out of the wagon train and let the others go on without them. President Young declared he would not leave them at the side of the road in dangerous territory. He instructed several men to cut the legs off Lucy’s poster bed and suspend the frame from the wagon bows so the mattress and springs would swing easily, like a hammock. President Young then renewed his blessing to Lucy and rode by her side for several days to make sure she had no further trouble. “With his gentle kind manner,” wrote Lucy’s grandson, “he won the love of Lucy and her posterity forever” (HRF, 157–58). Clothe yourselves with the bond of charity. We are not here isolated and alone, differently formed and composed of different material from the rest of the human race. We belong to and are part of this family, consequently we are under obligations one to another (DBY, 271). The Latter-day Saints have got to learn that the interest of their brethren is their own interest, or they never can be saved in the celestial kingdom of God (DBY, 271). The Lord will bless that people that is full of charity, kindness and good works (DBY, 280). The Savior used the story of the good Samaritan to teach us how we should love our neighbors. Charity. There is one virtue, attribute, or principle, which, if cherished and practiced by the Saints, would prove salvation to thousands upon thousands. I allude to charity, or love, from which proceed forgiveness, long suffering, kindness, and patience (DNW, 11 Jan. 1860, 1). We should have charity; we should do all we can to reclaim the lost sons and daughters of Adam and Eve, and bring them back to be saved in the presence of our Father and God. If we do this, our charity will extend to the utmost extent that it is designed for the charity of God to extend in the midst of this people (DBY, 273). Love your neighbor as yourself [see Matthew 22:39]; do unto others as you would that others should do unto you [see Matthew 6:12] (DNW, 20 Mar. 1852, 3). It is folly in the extreme for persons to say that they love God; when they do not love their brethren [see 1 John 4:20] (DBY, 271). We should commence our labors of love and kindness with the family to which we belong; and then extend them to others (DBY, 271). Be steadfast, always abiding in the truth. Never encourage malice or hatred in your hearts; that does not belong to a Saint (DBY, 273). Do I say, Love your enemies? Yes, upon certain principles. But you are not required to love their wickedness; you are only required to love them so far as concerns a desire and effort to turn them from their evil ways, that they may be saved through obedience to the Gospel (DBY, 272). Do any of your neighbors do anything wrong? They do. People come here from different parts of the earth, to make this their adopted country, and the old residents expect them to at once conform to and adopt their manners, customs, and traditions, or they think the new comers are not worthy of their fellowship. In other words, “if every man, woman, and child does not act, think, and see as I do, they are sinners.” It is very necessary that we have charity that will cover a multitude of what we may suppose to be sins (DNW, 11 Jan. 1860, 1). It should be satisfactory evidence that you are in the path of life, if you love God and your brethren with all your hearts (DBY, 271). Make sure the path for your own feet to walk to eternal life, and take as many with you as you can. Take them as they are, understand them as they are, and deal with them as they are; look at them as God looks at them (DBY, 274). Kindness. Be kind to all as our Father in Heaven is kind. He sends his rain upon the just and the unjust; and gives the sun to shine upon the evil and the good [see Matthew 5:45]. So let our goodness extend to all the works of his hands, where we can; but do not yield to the spirit and influence of evil (DBY, 272). Away with all little meannesses, and deal out kindness to all. Chasten, where chastening will answer best; but try persuasion before you try the rod (DBY, 277). If you are ever called upon to chasten a person, never chasten beyond the balm you have within you to bind up [see D&C 121:43] (DBY, 278). It has never altered my feelings towards individuals, as men or as women, whether they believe as I do or not. Can you live as neighbors with me? I can with you; and it is no particular concern of mine whether you believe with me or not (DBY, 278–79). In our [dealings] with outsiders—do not call them Gentiles—let our example be such as is worthy of imitation; then every one among them who is honest will say, “I guess you are right, I think I will come and stay with you” (DBY, 279). To be gentle and kind, modest and truthful, to be full of faith and integrity, doing no wrong is of God; goodness sheds a halo of loveliness around every person who possesses it, making their countenances beam with light, and their society desirable because of its excellency. They are loved of God, of holy angels, and of all the good on earth, while they are hated, envied, admired and feared by the wicked (DBY, 280). Good Works. The genius of our religion is to have mercy upon all, do good to all, as far as they will let us do good to them (DBY, 272). Let us have compassion upon each other, and let the strong tenderly nurse the weak into strength, and let those who can see guide the blind until they can see the way for themselves (DBY, 271). Pray always for all who are within the reach of mercy (DBY, 279). When you see a neighbor begin to slip, pray for him that he may have the Spirit of the Gospel as he once had. And if you feel this Spirit within yourselves, pray for an increase of that light you received when you first received the Gospel, and you will save yourself and house (DBY, 272). Suppose that in this community there are ten beggars who beg from door to door for something to eat, and that nine of them are imposters who beg to escape work, and with an evil heart practice imposition upon the generous and sympathetic, and that only one of the ten who visit your doors is worthy of your bounty; which is best, to give food to the ten, to make sure of helping the truly needy one, or to repulse the ten because you do not know which is the worthy one? You will all say, administer charitable gifts to the ten, rather than turn away the only truly worthy and truly needy person among them. If you do this, it will make no difference in your blessings, whether you administer to worthy or unworthy persons, inasmuch as you give alms with a single eye to assist the truly needy (DBY, 274). Condemn not; judge righteous judgment. Judge not, that ye be not judged [see Matthew 7:1]. Let no man judge his fellow being, unless he knows he has the mind of Christ within him [see Moroni 7:16–18]. We ought to reflect seriously upon this point; how often it is said—“Such a person has done wrong, and he cannot be a Saint, or he would not do so.” How do you know? … Do not judge such persons, for you do not know the design of the Lord concerning them; therefore, do not say they are not Saints. … A person who would say another is not a Latter-day Saint, for some trifling affair in human life proves that he does not possess the Spirit of God. Think of this, brethren and sisters; write it down, that you may refresh your memories with it; carry it with you and look at it often. If I judge my brethren and sisters, unless I judge them by the revelations of Jesus Christ, I have not the Spirit of Christ; if I had, I should judge no man (DBY, 277–78). It floods my heart with sorrow to see so many Elders of Israel who wish everybody to come to their standard and be measured by their measure. Every man must be just so long, to fit their iron bedstead [see Isaiah 28:20], or be cut off to the right length; if too short, he must be stretched, to fill the requirement (DBY, 279). If they see an erring brother or sister, whose course does not comport with their particular ideas of things, they conclude at once that he or she cannot be a Saint, and withdraw their fellowship, concluding that, if they are in the path of truth, others must have precisely their weight and dimensions (DBY, 279). Let us be patient with one another. I do not altogether look at things as you do. My judgment is not in all things like yours, nor yours like mine. When you judge a man or woman, judge the intentions of the heart. It is not by words, particularly, nor by actions, that men will be judged in the great day of the Lord; but, in connection with words and actions, the sentiments and intentions of the heart will be taken, and by these will men be judged [see D&C 137:9] (DBY, 273–74). Let all Latter-day Saints learn that the weaknesses of their brethren are not sins. When men or women undesignedly commit a wrong, do not attribute that to them as a sin. Let us learn to be compassionate one with another; let mercy and kindness soften every angry and fretful temper, that we may become long-suffering and beneficial in all our communications one with another (DBY, 273). 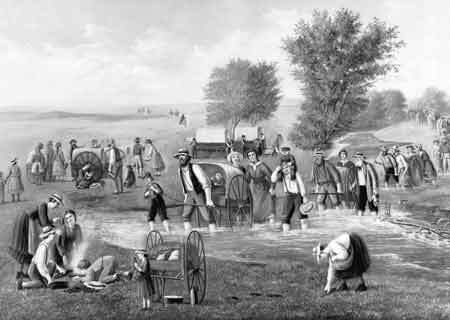 Handcart companies were often supported by contributions from the Saints to the Perpetual Emigrating Fund, which President Young established to help the poorer Saints gather to Zion. Serve the Lord, and try not to find fault with each other [see D&C 88:124]. Live so that you will not have any fault to find with yourselves, and never mind the faults of your brethren, for each person has enough of his own to attend to (DBY, 280). You may see, or think you see, a thousand faults in your brethren; yet they are organized as you are; they are flesh of your flesh, bone of your bone; they are of your Father who is in heaven; we are all His children, and should be satisfied with each other as far as possible (DBY, 271). Respect one another; do not speak lightly of each other. Some, if they get a little pique against an individual, are disposed to cast him down to hell, as not worthy of a place upon earth. O fools! not to understand that those you condemn are the workmanship of God, as well as yourselves! God overlooks their weaknesses; and so far as they do good, they are as acceptable as we are. Thank God that you know better, and be full of mercy and kindness (DBY, 274). God bless the humble and the righteous, and may He have compassion upon us because of the weakness that is in our nature. And considering the great weakness and ignorance of mortals, let us have mercy upon each other (DBY, 272). The merciful man shall find mercy [see Matthew 5:7] (DBY, 273). I am very thankful that it is not our province, in our present condition, to judge the world; if it were, we would ruin everything. We have not sufficient wisdom, our minds are not filled with the knowledge and power of God; the spirit needs to contend with the flesh a little more until it shall be successful in subduing its passions, until the whole soul is brought into perfect harmony with the mind and will of God. And we must also acquire the discretion that God exercises in being able to look into futurity, and to ascertain and know the results of our acts away in the future, even in eternity, before we will be capable of judging (DBY, 278). Build faith in one another and avoid contention. If we could obtain that faith and confidence in each other, and in our God, that when we ask a favor, we could do so with a full assurance and knowledge that we should receive, do you not perceive that it would lead us directly to do as we would be done by, in every transaction and circumstance of life? It would prompt us to do, not only as much as requested, but more. If your brother should request you to go with him a mile, you would go two; if he should sue you for your coat, you would give him your cloak also [see Matthew 5:40–41]. This principle prompts us to do all we can to promote the interest of each other, the cause of God on the earth, and whatever the Lord desires us to do; makes us ready and willing to perform it at once (DBY, 275). But if we lack confidence in each other, and be jealous of each other, our peace will be destroyed. If we cultivate the principles of unshaken confidence in each other, our joy will be full (DBY, 275). The work in which you and I have enlisted is to restore confidence in the minds of the people; and when I hear of circumstances transpiring in which brethren forfeit their word I regard it as a blot upon the character of this people. We should keep our word with each other. And if we have difficulty or misunderstanding with each other, talk it over, canvass the subject thoroughly, seriously and discreetly, and we shall find that all difficulties will be remedied in this way easier than any other; and we shall also find that nearly every difficulty that arises in the midst of the inhabitants of the earth, is through misunderstanding; and if a wrong in intent and design really exists, if the matter is canvassed over, the wrong-doer is generally willing to come to terms (DBY, 276). When a difference of judgment exists between two parties, let them come together and lay their difficulties at each other’s feet, laying themselves down in the cradle of humility, and say, “Brother (or sister) I want to do right; yea, I will even wrong myself, to make you right.” Do you not think that a man or woman, acting in that manner towards his or her neighbor, would be justified by the law of righteousness? Their judgments come together, and they are agreed: there would, consequently, be no need of calling in a third person to settle the difference. After taking this course, if you cannot come together, then call in a third person and settle it (DBY, 276–77). Contentions frequently arise to so alienating a degree that brethren have no faith in each other’s honesty and integrity, when, perhaps, both parties have stumbled over a little, selfish, ignorant, personal misunderstanding, are carrying it to the extent of wishing to cut each other off from the Church. Very frequently such cases are presented before me. Unravel the difficulty, and it is found to have started in a trifling misunderstanding in relation to some small matter; all the trouble has arisen from a most frivolous cause. Avoid nursing misunderstandings into difficulties (DBY, 277). If your neighbors talk about you, and you think that they do wrong in speaking evil of you, do not let them know that you ever heard a word, and conduct yourselves as if they always did right (DBY, 277). Let us from this time forth live so as to create confidence in all men with whom we deal and come in contact; and treasure up each particle of confidence we obtain as one of the most precious possessions mortals can possibly possess. When by my good actions I have created confidence in my neighbor towards me, I pray that I may never do anything that will destroy it (DBY, 276). What “obligations one to another” do we have as members of the human family? How do our attitudes and actions toward others affect our own salvation? How can charity help us “reclaim the lost sons and daughters of Adam and Eve”? Why can’t we truly love God if we do not love other people? Why is it vital to “look at [others] as God looks at them”? How can you increase your ability to do this? Charity, “the pure love of Christ,” can be expressed in many ways (see, for example, Moroni 7:45–47). What are some expressions of charity that President Young emphasized? In what ways can you show more charity to those with whom you come in contact? How have others shown charity to you? What did President Young counsel about judging one another? How can you apply this counsel when interacting with those who may think or behave differently than you do? What can be the consequences if we judge our fellow human beings unrighteously? What can help us judge righteously if we are in a position where we must judge another person? (See also Moroni 7:14–18.) Why is it important for us to show mercy to each other? How can remembering that we are all children of God help us in our relationships with our family members, friends, and acquaintances? How do we build faith and confidence in each other? What are the results if we do? What will happen if we do not have confidence in each other? What are some sources of contention? (See also 2 Nephi 26:32–33.) What is contention and how can we avoid it? What have you done in the past to successfully avoid contention? How did President Young counsel us to behave when disagreements or conflicts do arise? Why do you think President Young described the confidence of others as “one of the most precious possessions mortals can possibly possess”? What specific things can you do to increase other people’s trust and confidence in you?